At this time of year, amidst the festive flurry of holiday parties and visits, many of us find ourselves scrambling to identify just the right gift for our loved ones (especially those of us with a newborn at home, who may not have had time for the usual latte and window shopping...sigh). This can be especially tricky when one of those most dear to us is particularly difficult to gift. Finally, a few years ago, I stumbled upon a simple solution: turron. For those of you not familiar with this treat, turron is an almond-based, Spanish Christmas candy, of which I consumed copious quantities when I lived there. I had a hankering for it over the holidays and was searching for it on line when it hit me--dad loves almonds, he loves simple flavors, and, in spite of his remarkable self restraint, he definitely loves sweets. Three boxes of Turron de Alicante were soon en route to his doorstep that year and were devoured within 24 hours of their arrival...or so the story goes. Sweet success! Now, each year, in addition to whatever attempt I make at an inspired gift for my father, there are always a couple of boxes of turron, sure to please and to give him a rare opportunity to overindulge. Of course, the one thing that could make this gift even better is if it were locally made and crafted. After all, shipping candy all the way from Spain to New Orleans is not the most sustainable practice. Thankfully, with the steady rise of the local food movement, many foodie entrepreneurs are creating delectable treats with local, seasonal ingredients. And, with so much care and craftsmanship behind these products, the quality often surpasses that of the mass-produced name brands that many of us associate with holiday fancies. Such is the case with the remarkable sweets made by Valerie Conyngham of Vianne Chocolat, whom I recently wrote about in the winter issue of Edible Boston. 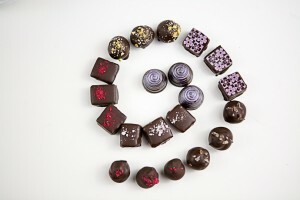 Based in butter and cream from small, local dairies, her chocolates are infused with local products and produce. Her strawberry balsamic chocolate includes a strawberry jam from the Copley farmers market, and her fall flavors include pumpkin seeds and apple, two unusual companions for chocolate that could only come from being locally inspired. The brilliance of giving such sweets as a gift is that, in addition to the exceptional, creative flavors, you're supporting local business and agriculture and the many individuals who work so hard to make local, sustainable eating a truly viable option, even when it comes to fine chocolates. You can tell your special someone that, in addition to the fun and tasty treat, you've made a contribution to a very important cause in his or her honor--sweet success, doubled! For more information on where to find Vianne Chocolat or how to order on line, visit Valerie's website. And, if I were you, I'd pick up a little box for myself as well. After all, such thoughtful, responsible holiday shopping deserves a little reward! Happy Shopping, Happy Eating, and Happy Holidays!